Disney's update on its 1991 classic not only lives up to expectations, but surpasses them, in a warm and magical film to inspire a whole new generation. After it was announced over two years ago that a live-action remake of the beloved 1991 animated classic would be released, Beauty and the Beast must be one of the most anticipated Disney movies in recent years, and for good reason. The film has an all-star cast (including Ian McKellen, Emma Thompson, Ewan McGregor and Luke Evans, to name a few), and of course, everyone was eager to see if Emma Watson would be capable of singing and embodying one of Disney’s most well-known and loved princesses, Belle. So, was the update as good as the original? It is even better. As a self-professed Disney fanatic, and especially a lover of Beauty and the Beast, I was intrigued to see how Watson would tackle the role of Belle, and what Disney would add to the story in this updated film. Right from the outset, we are instantly drawn back into the world we remember with a live action prologue, rather than the series of stained glass paintings we see in the animation; this presents the tale of the Beast’s curse in an emotive and engaging manner. Straight after this, we are presented with a familiar scene, an accurate recreation of the film’s opening number ‘Belle’, and Emma Watson appears for the first time. To be clear, Watson is no singer. After singing lessons and post-production Disney magic, she sings sweetly and in tune, but her voice adds nothing per se to this movie. This being said, it doesn’t take anything away either, and I now absolutely understand and respect her casting. Whether you like her or not, it cannot be disputed that Watson is a stunning Belle, an image of grace and beauty in the gorgeous wardrobe she dons throughout the film. More importantly, Watson carries her strong views on women’s rights and feminism into her characterisation, portraying a fearless woman who values education and freedom over marriage and settling down. She is an empowering heroine in a society where the villagers actively reprimand her for reading and teaching young girls how to do the same, and is a positive role model for young watchers to look up to. Dan Stevens is also excellent as the Beast, giving an endearing performance accompanied by impressive CGI. His eyes become a focal point, a never-changing aspect of a character who otherwise visually grows from a bitter monster into the kind and compassionate soul which lies beneath; this small detail becomes a very special one as the film progresses. The ever-funny and entertaining LeFou (Josh Gad), sidekick of Gaston (Luke Evans), is interesting to watch, given the highly-publicised revelation that he is the first ever gay Disney character. With this in mind, the character’s sexuality is tastefully represented yet clear, a refreshing element which holds plenty of promise for gay representation in future Disney films. Composer and Disney legend, Alan Menken, has arranged some beautiful orchestrations, combining the well-known music of the film with motifs from the stage production, as well as writing three new songs for the updated movie, including the wonderful ‘Evermore’, sung by the Beast as he realises his feelings towards Belle and what it means to truly love another. With regard to the original songs, ‘Gaston’ and the film’s landmark musical number ‘Be Our Guest’ truly stand out for their sheer theatricality. Luke Evans has a remarkable singing voice, which makes for a fun tavern scene in his character’s eponymous song. As for ‘Be Our Guest’, high expectations from the spectacular 1991 scene are not disappointed when Lumière (Ewan McGregor) leads the dancing tableware in a musical extravaganza brimming with special effects and theatrics. 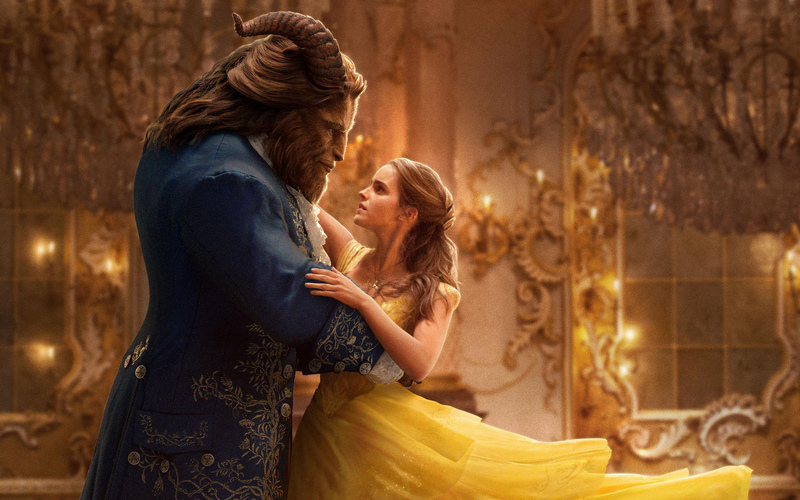 Another memorable scene, Belle and the Beast dancing in the ballroom, is just as enchanting as before. Emma Thompson provides a charming rendition of the title song, ‘Beauty and the Beast’, as Mrs Potts, while Watson, in the iconic yellow ball gown, and Stevens glide effortlessly around the breathtakingly magical ballroom. Beauty and the Beast not only lived up to the hype surrounding its release, but in many ways surpassed it. The live action and added content enhances the story and themes from the animated classic, and brings a beloved film into the 21st Century to inspire a new generation. With a stellar cast and dazzling cinematography, Beauty and the Beast is a glorious spectacle to behold. Beauty and the Beast (2017), directed by Bill Condon, is distributed in the UK by Walt Disney Studios. Certificate PG.